Law students Dr. Dona Stevens and Dr. Barrett Vaughan represented Abraham Lincoln University’s Park Senate this past summer at Delta Theta Phi Fraternity’s (DTP) 60th Biennial Convention & Leadership Conference in New Orleans. 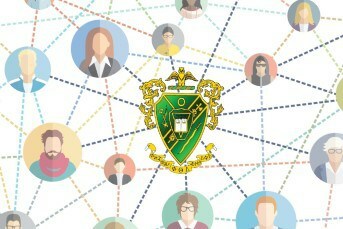 For three days, the law fraternity brothers and sisters from all over the country met at the Crowne Plaza Hotel (many for the first time) for a special blend of networking, education, and programming designed to encourage them to become more effective practitioners and leaders. Barrett and Dona came back from their trip with plenty to report! First of all, a little background on these two accomplished students. Barrett earned his B.S. in Agricultural Engineering from Michigan State University and his Ph.D. in Agricultural and Biological Engineering from Pennsylvania State University. While attending his undergraduate program, he noticed that many of his older classmates were considering law school after graduation. This planted the initial idea of how a legal education could benefit his career, leading him to actually take the LSAT. It wasn’t until some twenty years later, however, that, as a professor, Barrett decided to take the plunge and work toward his J.D. He wasn’t about to give up his career in the process though, which is what lead him to research online law school options. And then there’s the ambitious Dr. Dona Stevens. She attended California State University where she earned her BA in Liberal Studies & Education as well as her MA in Educational Leadership. Later, she attended Nova Southeastern University and earned her Ed.D in Educational Leadership. After a fruitful career as an administrator for the Los Angeles Unified School District and an adjunct professor for California State University, Dona decided it was time to pursue another one of her academic passions: the law. ALU’s online platform and the flexibility that she knew it would afford her convinced her that ALU would be the perfect fit. Though neither Dona nor Barrett have ever been apart of any other Greek-life organizations before, they were both equally enthused to be invited to join such a large and prestigious law fraternity. But this was, as it turned out, definitely not a vacation. Barrett commented that the highlight was that they actually got some work done! Dona even said that there were multiple speakers and activities planned for the Senate members and everyone was very lively and engaged. Barrett is already excited about the next conference for the purpose of renewing the relationships that he formed this summer and remaining active in the organization. As an educator, Dona sees Delta Theta Phi as being invaluable to Abraham Lincoln University’s law students and looks forward to helping the university gather more members and create more opportunities for leadership. If you are a law student at ALU and interested in becoming a member of Delta Theta Phi, please inquire about our senate’s application process by calling 213-252-5100. PreviousALU Got a Higher Bar Passage Rate For The Feb 2017 GBX Than The Average ABA Rate!